The Administrator for the camera chain Jessops say he's had several inquiries from potential buyers but that shops will still close and jobs will be lost. The company which has its headquarters in Leicester has suffered from online competition and advances in camera phones. Jane Hesketh reports. The Leicester based camera retailer Jessops has gone into administration. It puts 2,000 jobs at risk as the company's administrators, Price Waterhouse Cooper, say that store closures are 'inevitable'. Shoppers in Leicester are sad to see the store struggling. 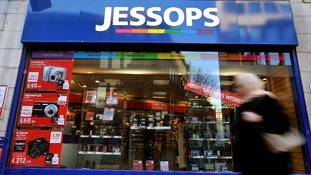 The Leicester based camera chain, Jessops, has become the first high-profile retail casualty of 2013. Its administrators, Price Waterhouse Cooper, has said that store closures are 'inevitable'. The retailer has 192 stores across the UK. It puts 2,00 jobs at risk. Questions are now being raised on the impact this will have Leicestershire's economy. Louise Cooper, financial expert spoke to ITV Daybreak about the issues that specialist retailers face. She said that retailer Jessops has suffered from the smart phone camera, and that an online offering could be a way for it to move ahead.